Taxi to tomorrow with this saucer of space-age sounds! Sound, sustain, and silence unite, polyrhythmic Hammond organs and xylophones round off a cosmic eruption! Created for the 1962 World?s Fair, this album bundles beautifully textured space sounds with period-perfect narration. Take the Gayway to a surplus of recognizable moments lifted for modern-day samples! Man In Space With Sounds is a commemorative album of 12 tracks dedicated to the Seattle World?s Fair. Envisioned and conducted by Attilio ?Art? Mineo, this unearthly album was released in 1959, but its roots go as far back as 1951 when Mineo carved out many of the uncannily clandestine melodies. They?re an inebriated burlesque of circus organs, tipsily galloping bongo beats and electronic hydrazine expectorations that enclose the listener. 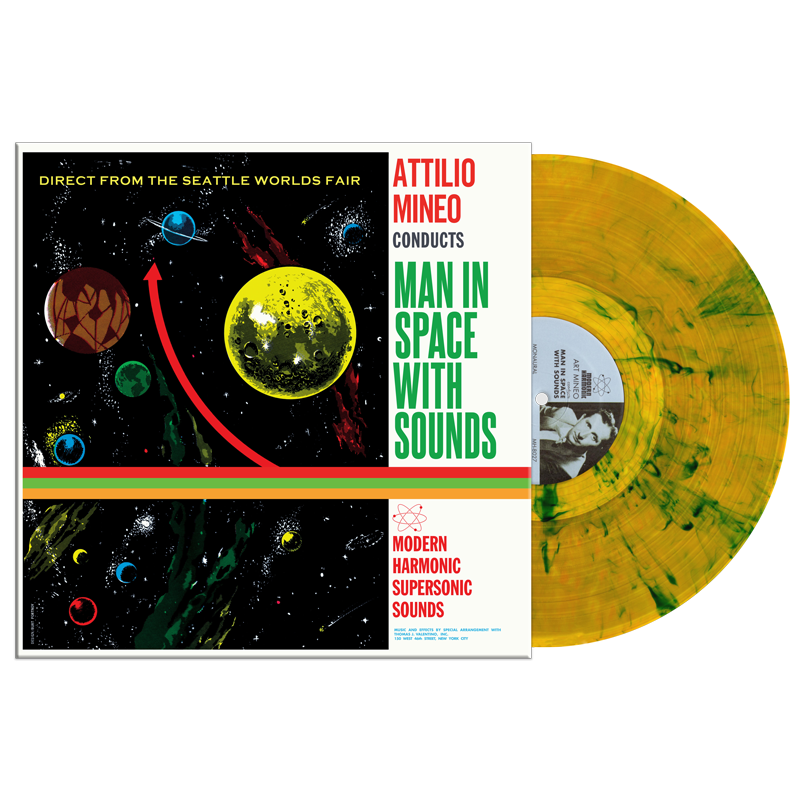 In anticipation of the World?s Fair, Attilio mined these pieces from his archive and paired them with out-of-this-world narration to guide your journey. This narration is a milky way of recognizable sound bites that have been sampled by the best. Available on your choice of cosmic swirly green and yellow vinyl and packaged in a stunning gatefold jacket or a CD with a coloring book style insert; this is the kind of future the Seattle State World?s Fair promised!